Lumen, Silex, Slim, etc. you’ve heard of all of them. In this article, we’ll take a look at a newcomer called Blink. Blink was built to improve high performance applications that consume a lot of server resources, and it uses the Swoole PHP extension to achieve this goal. As an example, we will build a Blink powered notejam for our demo. Let’s get started. We mentioned earlier that Blink relies on the Swoole extension for better performance. You can install the Swoole extension from source on Github. Follow this article if you don’t know how to do it. The alternative way to install it is by using the PEAR package manager, which is the approach I’ll take. I will be using an Ubuntu 14.04 image with the LAMP setup for this article, configured via Vaprobash – to get this exact setup, refer to the Vagrantfile in this project’s final repo. We could’ve used Homestead improved to easily set up the environment, but the Swoole extension is only compatible with PHP 5 for now, and Homestead Improved uses PHP 7 by default. The current Swoole version is 1.7.22-alpha and it’s not compatible with PHP 7, but there is an ongoing effort to make this happen in the next minor version. After the commands above execute, we’re asked to add the extension=swoole.so line to php.ini. You can make sure that the extension is loaded by listing the available PHP modules command. Blink is available on Packagist, so we can use Composer to create a new project. After all the dependencies have been loaded, you can run the server from the command line. This command will run an interactive shell for logs. However, you may use the php blink server start/stop/restart commands to manage the server. While Blink doesn’t provide an option from the command line to specify the port, we can use the config/server.php file to change it. Now, restart your server and check the browser using the new port. The config folder also holds configuration for our app and services. A sign in page with the forgot password option. Blink doesn’t provide a templating engine by default, we need to choose and inject our own. I chose to work with Twig, but you can easily switch to another engine like Blade, Smarty, etc. The src/bootstrap.php file is responsible for registering our routes, services and executing our application, and we will use it to bind the Twig engine to the application container. Blink uses the Yii container for dependency injection. It has constructor and method injection, auto resolving for dependencies, etc. Check the documentation for more details. 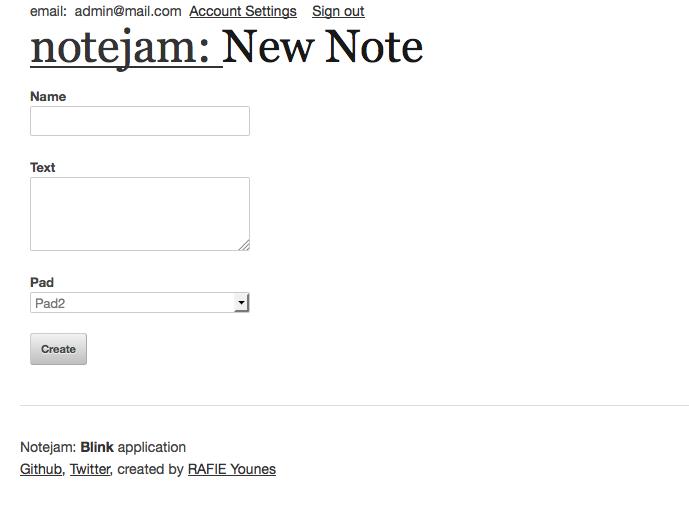 The Notejam application requires database access for managing users, notes and pads. We’re going to use the Eloquent package for that, so we need to require it using Composer. We also required the console and filesystem packages to use database migrations to build our database. After registering our command, we can run php blink migrate to create our database. Application routes are registered inside http/routes.php, and should return an array containing our routes definitions. The first item in the array should define the request method. This could be a single item or an array to handle multiple request methods. The second item defines the request URL, and can contain rules for parameters. // You can also use regex to filter parameters. The third item specifies the request handler. This could be a Closure or a class name like the example above. Check the routes documentation for more details. Our full routes file looks like this. Controllers are stored inside src/http/controllers, and you can avoid using the fully qualified namespace of your class if you store them there. However, you can use another path and change it inside the src/config/app.php file. The Notejam application provides the HTML templates to be used, and we’re just going to convert them to Twig templates. We’re extending the master layout that defines the common page structure including our page header and the errors partial. We have access to the app container instance because we registered it as a global variable inside the Twig instance. Our sign up form contains an email, password and a password confirmation field. Now we need to render our page. We handle the form submission inside our UserController@store method, and because we’ll need some validation logic, we can use the Illuminate/Validation component. So, let’s bind it to the container using our src/bindings.php file. 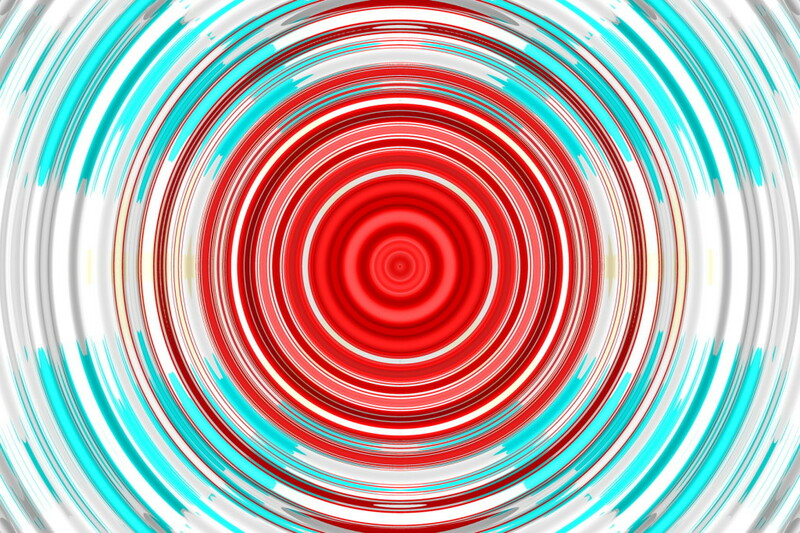 The setPresenceVerifier method is useful in this case because we’ll be using the unique validation rule, which tests for the existence of the element in the database. Blink supports method injection, so we can just pass our classes as a parameter and they’ll be automatically resolved for us. After building the validation rules, if anything fails we return with old inputs. The $request->session object holds our current session instance, and this is where we store our success and error messages to be displayed by the errors partial. Using PHP sessions, cookies and header functions won’t work, but we can access them from the request object ($request->getSession()). Note that this could be a problem for other packages you may want to install into your project. Before logging users in, we need to configure our authorization component. The next step is to update our User model and fill the Authenticatable interface methods. The findIdentity method will be used to authenticate users using the primary key or email, and validatePassword will test the login password against the current user instance. We validate inputs the same way and display errors in case of failure. The auth() helper will resolve the blink/auth/Auth instance from the container, and we attempt logging the user in with the request credentials. 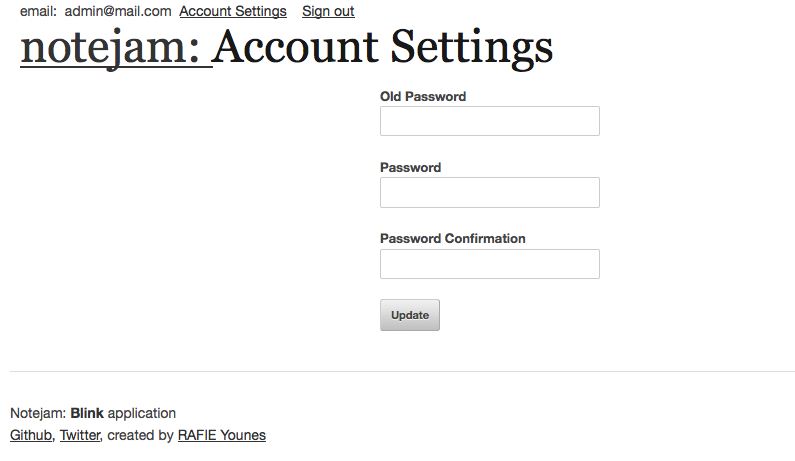 If the login credentials are correct, we redirect the user to the settings page. Blink doesn’t manage our session automatically, so we need to set the session cookie on login and set it on the request on page load. Blink allow us to bind our services to the container using a configuration array. Blink uses Yii’s configuration concept to initialize class attributes. We use a closure function to initialize the sessionKey using the cookie variable if it exists. After a successful login attempt, we can access the logged in user from the request object using $request->user() and $request->guest(). Check the documentation for more details about authentication. The logged in user has the ability to change his password. He must enter the old password, the new password and a confirmation. We follow the same steps as before. The $hash->check method compares a value with a hashed version. After updating the user settings we return with a success message. The problem here is that we are accessing the $request->user() method directly which returns the currently logged in user, but what if the user is not logged in yet and tries to access the settings page? To guard our routes we can define a list of middleware to our request object. We can do that inside our services.php config file. Now we need to create our AuthMiddleware inside the src/http/middleware folder. The middleware will intercept all the requests, and we should compare the current request with our guarded routes. The Request@match method tests the current request path against a regular expression. It uses the PHP preg_match function, so we need to define our guarded routes as regular expressions. 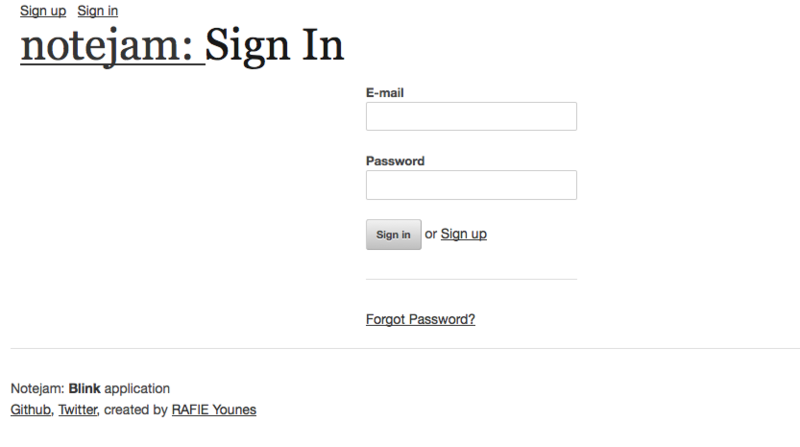 If the user is not logged in and tries to access one of the guarded routes, we redirect them to the sign in page. 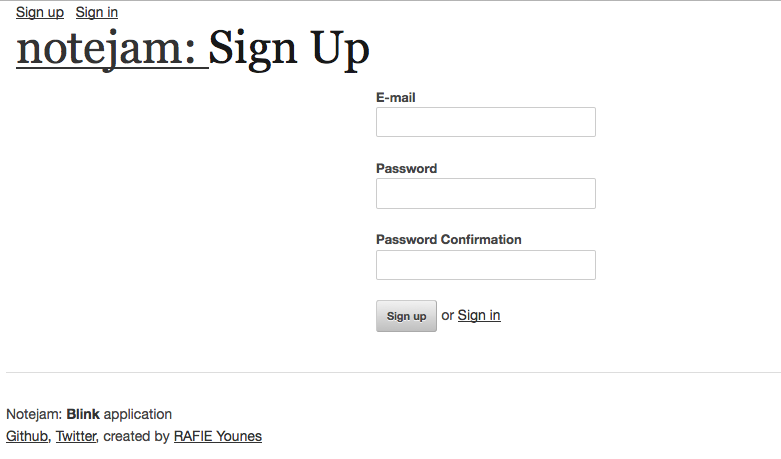 We also want to prevent the user from accessing the signin and signup pages when they are logged in. You can also use the before and after methods inside the controller to achieve the same result. If you noticed, in the services file, the response object also has middleware. It can be used to intercept the response object and add some information to the response, or act as a response formatter. The NoteController class is responsible for handling our notes’ CRUD operations. Because Blink supports method injection, we pass the Request and Note objects and query the user notes. A logged in user can only view his own notes and manage them. And because we’ll need to often check for this condition, we’re going to put it in a separate method. 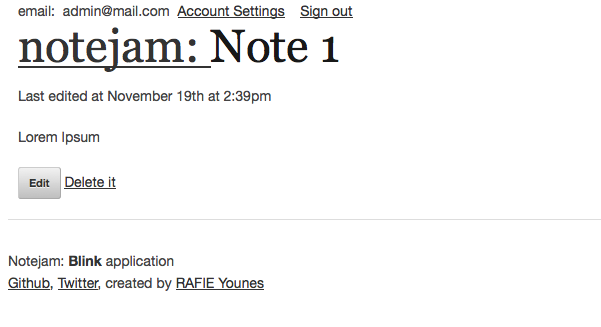 The new note view has a name, a text, and a pad input. Because we already set up our model relations, we can also do something like $request->user()->pads. The store method handles the form submission. We follow the same process of validating data and returning errors in case of messages. To avoid pasting repetitive tasks for updating, deleting, and viewing notes you can check the final result on Github. The repository also contains the installation steps. Although Swoole and Blink try to economize server resources by keeping your application resources alive through the application’s lifetime, the request and response objects are always refreshed on every request. Blink provides a ShouldBeRefreshed interface that you can implement to indicate that the class instance should be refreshed on every request. Blink is a newcomer and still in its early development stages. You can collaborate by writing documentation for different components and send pull requests for new features. If you have any questions or comments you can post them below and let us know what you think about this new framework!